This lightweight Aluminium wheelchair is a value for money entry into the Aluminum wheelchair range that does not compromise on quality. 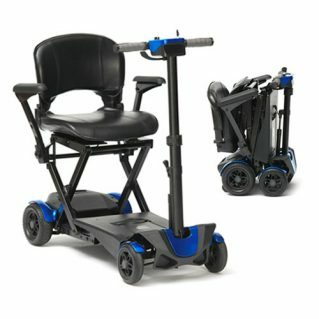 A comfortable 18” seat is complemented by padded armrests, pneumatic rear tyres which improve the ride, swing away height adjustable footrests to allow for easy transfers on and off the chair and, being made from aluminium, the chair is lighter (only 8.5kg with all quick release items removed) than many other similar priced wheelchairs on the market. Fitted with 24″ quick release rear wheels, a folding frame with removable footrests and half-folding backrest, easy to transport and store. The solid puncture proof front castors are virtually maintenance free whilst the nylon seat & back covers are easily wiped down. An integrated lap belt improves safety for occupants and rear stepper tubes allow carers/attendants to climb kerbs safely.